In the digital age of real estate, photography is becoming more and more essential. Buyers are looking for homes online, and if your photographs don't stand out, then you have no chance to attract buyers to your home. We're extremely excited to introduce our 3D photography partner, Matterport. Matterport is a service that can come into your home and take panoramic 3D pictures, which they then stitch together to form a complete walkthrough of your home. This technology is absolutely incredible! You can 'tour' the home online, but the most unique feature is that you can literally take the roof off of the house and view the floor plan from above. This allows you to see how everything flows throughout the home. This allows buyers to spend time in your home without the inconvenience of an actual showing. If you choose to use 3D photography, your home will most certainly stand out from the competition. The last home that we did 3D photography for sold in only 15 days, so it definitely increases your chances of selling quickly and for top dollar. To learn more about Matterport, visit their website: www.matterport.com. Please don't hesitate to contact us with any of your questions! Where Is the Phoenix Market Heading and What Does It Mean for You? The October numbers are in for the Phoenix real estate market, which makes now a great time to take a look at recent trends. We've been in a strong seller's market for quite some time, but we saw the market loosen up a bit for buyers. In some areas, we've even seen things take a turn into a buyer's market. Overall, data seems to show that we're heading back to a neutral market. Right now, there are only 21,439 homes on the market, a drop of 13.7% from this time last year, when we had around 25,000 homes on the market. This year we have 5,021 pending listings, whereas last year we had just under 5,300, which is a change of 10%. Monthly sales have dipped a bit, as we sold 6,200 homes this October versus 6,271 last October; this is a small drop, which can mostly be attributed to the big changes we saw in the lending process. The new TRID requirements have likely caused delays, which will probably make November look like a bigger month because some closings got pushed past the later days in October. The monthly median sales price came in at $213,000, which is a significant increase over the $192,000 median sales price we saw last year. This number is thrown off a bit, however, because we aren't selling as many $200,000 and under homes; we're actually selling more higher-end homes than we usually do. Right now, we're still in a seller's market, but as these numbers show, we're heading to a healthy neutral market. If you want to take advantage of these conditions, there's no reason to wait; the holidays are a great time to sell because of a decrease in competition and an increase in snowbird buyers. If you would like more information about current market conditions, or if you need real estate assistance of any kind, please don't hesitate to reach out to us. We would love to hear from you! Introducing... 3D Technology For Our Sellers!! If you've ever spent time looking at homes online, you know how difficult it is to get a "feel" for a home without going to the property. We think we have the ultimate solution!! Summit Home Consultants is excited to announce a new product for our listing (Seller) clients. Matter port 3D Technology.. This new feature that we've added to our listing package will allow potential Buyers to literally "walk through" your home while sitting at their computer. It also has a "doll-house" feature that allows the viewer to literally take the roof off the top of the home and stare down into the home, getting a feel for the floorplan. We are always striving to sell our homes at the highest price and in as little time as possible, and we feel this new service will help to achieve these goals. If you are thinking of selling your home, give us a shot at earning your business. There is a reason our agents sell more homes per agent than any other real estate team in the Valley. We Care!! Take a look at our latest listing in Peoria, AZ at 25538 N 104th Dr.! What Should You Know About Phoenix Real Estate? Today I'll be providing you with a brief real estate market update for Phoenix and the surrounding areas. You should know that the market stayed relatively flat in August, but let's go over some numbers real quick. -There are 19,000 homes on the market, an 18% drop from last year. -Pending listings are up 5.2% from last year. -There were 7,500 sales this August, which is up 9% this year but down 12% since July. -Median sales price is $208,000. Overall, we're seeing a slight tilt back towards a seller's market, but we're still seeing a large buyer's market in most price ranges. One other interesting thing is that the number of Canadian buyers in our market is falling. They are usually a large part of our market, but even without them, we're still putting up big numbers. As always, please don't hesitate to contact me with any questions about buying or selling real estate in Phoenix! Today, we are joined by Lizy Hoeffer from Prospect Mortgage to discuss how lenders can give buyers a leg up in the market, and whether the rumor that you have to put 20-25% down on a home is true. One of the most important things for a buyer in today's market is to get pre-qualified. Lizy and her team can usually put together a pre-qualification in less than 24 hours. Getting pre-qualified is just the first step; getting pre-approved definitely makes our buyers look more appealing to the sellers. You will need to provide 30 days of payment stubs, last year's tax returns and W-2s, and two months of bank statements, and Lizy will take care of the rest. They even make calls to the seller on your behalf. Lizy's team is ranked in the top 1% of lenders in Arizona, so being pre-approved by them makes you look more credible to a buyer. However, a lot of buyers are hesitant to enter the market, especially those who have had credit issues in the past. Contrary to the rumor that's going around, you do not need to have a 25% down payment. In terms of down payment programs, there are programs that don't require any money down. Typically, you have to be a first-time home buyer or veteran to be considered for those. There are also programs that offer as low as 3% down for conventional loans, and there are government options out there as well. Ultimately, there are a ton of mortgage options out there. If you have any questions on what programs are available to you, contact Lizy Hoeffer at (480) 818-6222, or go to http://lizyhoeffer.com. You can also visit my site for all of your real estate needs at www.forsalephoenixhomes.com. As always, if you have any questions about real estate, give me a call or send me an email. We'd be happy to help you! Today, Lizy Hoeffer of Prospect Mortgage is here to talk about some of the changes to TRID resulting from Dodd-Frank that are coming up in October. The new TRID is part of Dodd-Frank action, new laws that were implemented last year, aimed at helping consumers better understand their mortgage documents and prevent any rushed or predatory lending. Some of the new changes that are coming out have to do with extended wait periods to review disclosures; also, two forms will be merging into one, the Good Faith Estimate and the Truth in Lending sheets. At the moment, clients receive a ton of different documents and each one has a separate line item for different costs, which are broken down into a different form. To make all of this easier, the documents have been consolidated so that clients can understand what the fees are for their home purchase and what the annual percentage rate is over the term of the loan. One of the big things this new action is doing is giving consumers a right of rescission period. This means that if you get the loan documents turned in to the title company on Monday, you have a 3-business-day waiting period before you can actually close. This will help clients from being rushed to sign at the closing table, giving the clients plenty of time to absorb and understand the financial contract they're getting themselves into. One of the negatives of these changes is that it takes a bit longer to close. If a deal goes sour late in the process, you'll have to go through all the waiting periods again as you find a new lender. In other words, the days of 10-day closings are over. All in all, these changes aren't that big of a deal. If you have any questions about this new process, don't hesitate to reach out to Lizy at (480) 818-6222 or LizyHoeffer.com. You can also visit my site for all of your real estate needs at www.forsalephoenixhomes.com. Of course, if you have any real estate questions, don't hesitate to reach out to us! We would love to hear from you! Is Phoenix in a Buyer's or Seller's Market? A lot of people have been asking me how the market is doing lately, and today, I'm going to answer that question. In order to determine whether we have a balanced market, we look at the inventory. Inventory is measured by looking at how long it would take to sell the homes currently on the market if no other homes were listed. Any time we have between four and six months of inventory, it's considered a balanced market. Anything below four months means we are in a seller's market, and inventory above six months equates to a buyer's market. We currently have about 16,000 homes on the market, which might sound high, but is actually very low. Overall, Maricopa County has about 2.6 months of inventory. This indicates that we are in a strong seller's market, but that is really only the case in certain areas and in certain price ranges. For example, in the $100,000 to $200,000 range, there are only 1.6 months of inventory. In the $200,000 to $300,000 range, we have 2.1 months of inventory. The $300,000 to $400,000 price range has a 3.3 month supply of inventory. Basically anything under $400,000 is in a seller's market. We don't have much inventory, and there are a lot of buyers out scooping up homes. The top three cities for sellers are Avondale, Surprise, and Glendale. However, if you are looking for homes priced between $400,000 and $600,000, we are running on about 4.5 months of inventory. That is a balanced market. Homes $600,000 and up are leaning towards a buyer's market. In fact, in the $1 million to $2 million range, we have 9.6 months of inventory. The top three cities for buyers are Scottsdale, Goodyear, and Chandler. So when you hear that we're in a seller's market, make sure you take a closer look at the price range and the area. If you have any questions, or are interested in buying or selling, please give me a call or send me an email. We would love to hear from you. Today I wanted to let you know what happened with real estate in Phoenix during the month of May. Inventory has dropped to 3.1 months of supply this year, as opposed to the 4 months that we had last year. This is a definite indicator of a seller's market, but it really depends on what your home is priced at. Any home under $200,000 will likely see a strong seller's market, where we have less than 1 month of inventory. However, the $400,000 and above range will be sitting right around 4-5 months of inventory, which is a more normal market. Currently our active listings are down by 20.4% from 2014, and pending listings have gone up by 12.3%. Monthly sales have also risen by 10.4%, and the median sale price is up by 9.6% ($211,000 is the median price right now). When everything is all said and done, we're in an extremely strong seller's market right now. If you're thinking of selling, now would be a great time to do so. If you're buying, you'll need an experienced agent to guide you through this competitive market. You'll need to be quick to purchase, as good homes are being bought up very quickly. Why Should You Ignore Your Zestimate? Hey folks, today I wanted to share something very important with you. Over the last few years, Zillow, Trulia, and Realtor.com have become very popular places to search, so we wanted to share some important information with you about one of those sites today. What I really want to focus on is the "Zestimate." It's Zillow's version of the appraisal, and at the end of the day, it's pretty much a joke. They even have a disclaimer on their site that states they are more than 5% off a home's actual value 60% of the time. To demonstrate my point, I'm going to show you 3 different homes. First, I'll tell you what we sold the home for, then I'll tell you what Zillow estimated the property would sell for. The first property is at 6938 E Quail Track Dr. We sold this home for $745,000, but Zillow estimated it would sell for $680,000. This particular home was undervalued by $65,000, almost a 10% difference. The next home is 4242 N 31st St. in Phoenix. We sold this home for $363,000 and sold it within 48 hours of listing. According to Zillow, this home was worth just $300,000. This home was undervalued by over $60,000, a 17% difference. Finally, we have this property on 7645 N 10th Ave. We sold this home for $660,000, and 30 days after escrow closed, checked its Zestimate. This home was only valued at $571,000. It was undervalued by nearly $90,000! 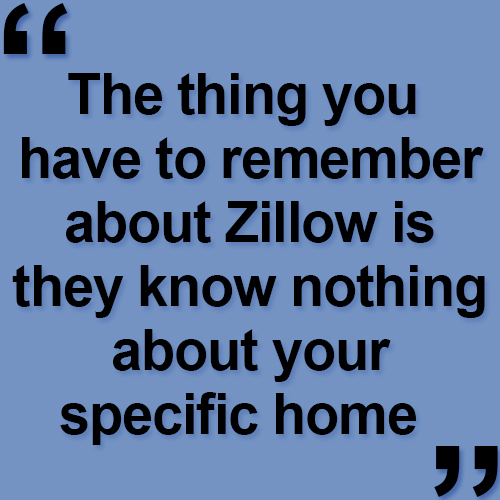 The thing you have to remember about Zillow is they know nothing about your specific home. They are pulling numbers from the tax assessor and taking an educated guess. They want you to go to their site and keep you there to sell advertising. Their motivation isn't any deeper than that. They don't want to help you sell your home. A real estate agent does. And if you are thinking about selling your home at a price comparable to your Zestimate, think twice, and give us a call or send us an email. We look forward to speaking with you soon!